The latest ZCCM-IH Annual Report is embedded below. ZCCM-IH is the investments holding company majority owned by the GRZ and holds minority equity interests in the successor mining companies created after the unbundling and privatization of Zambia Consolidated Copper Mines (ZCCM) in 2000. It is public listed on the LuSE. Its shares also trade on the Euronext stock exchange in Paris. Under the current shareholding structure, GRZ holds 87.53 % whilst 12.47% is held by minority shareholders. Following privatization of ZCCM in 2000, ZCCM-IH inherited debt of approximately USD 363 million on its balance sheet. And for the next ten years the company was technically insolvent - and therefore unable to pay any dividends to its shareholders on account of this legacy debt. The news concerning the thousands of our fellow citizens who have withdrawn from the University of Zambia where they were accepted to pursue studies because they could not get government bursaries is disgraceful. It is shameful that at a time when our beloved country is about to celebrate 50 years of independence, we cannot afford to provide bursaries and/or loans to all our fellow citizens who have worked so hard over the years to finally get a nod to pursue higher education. Accessible and high-quality education can, therefore, be said to be the most important investment a government can make, simply because it is practically not possible for any country to succeed in the pursuit of other human endeavors without adequate pools of skilled and enlightened citizens. Fellow country men and women. As you are aware, His Excellency Mr. Michael Chilufya Sata, President of the Republic of Zambia has been receiving medical attention in London, in the United Kingdom. He left Zambia with the first lady and other close members of the family on October 20, 2014. However, it is with a very heavy heart that i address you today, to inform the nation that our beloved President and Leader, His Excellency, Mr Michael Chilufya Sata has passed on. The head of state passed on, on October 28, 2014 in London at 23:11 hours Zambian time at King Edward VII Hospital Beaumont, Central London. His spouse, the First Lady of the Republic of Zambia, Dr Christine Kaseba-Sata, his son the Mayor of Lusaka, Mulenga Sata and others were present at the bedside at the time of his passing on. President Sata was born on July 6, 1937. Mr. Sata became the fifth president of Zambia on September 23 2011 after a popular poll. President Sata’s demise is deeply regretted. During this difficult period, I urge all of you to remain calm, united and peaceful during this very difficult period. The nation will be kept informed of other details regarding the funeral and burial arrangements. May God strengthen Dr Kaseba Sata and the all the family members. Very sad news indeed for them and the whole country. May God also give Vice President Guy Scott and the Cabinet all the necessary wisdom as they rule the country for the next 90 days. It is a weighty situation for Dr Scott, but every tragedy is also pregnant with opportunity to refashion the country positively. The demise of Mr Sata inevitable leaves PF without a designated successor. It is very unlikely that Guy Scott would stand. Therefore PF will need to quickly move to identify a party president. That process is fraught with difficulties because we are dealing with at least four bases of power : the Cabinet members; Members of Parliament; Members of the Central Committee; and, the party in general. The opposition will of course need to coalesce to stand any chance of an upset. Very interesting days ahead politically. A culture of living hand-to-mouth does not safeguard the interest of posterity. We have the duty and responsibility to secure the future of the next generations. In this regard, I have allocated K100 million for the establishment of a sovereign wealth fund. Going forward, a significant proportion of the dividends from state-owned enterprises that will fall under the Industrial Development Corporation [IDC] will form part of the fund"
There’s currently no publicly available government policy document that explains the nature, purpose and governance framework of the new SWF. A scan through the revised Sixth National Development Plan (SNDP) mentions the IDC but says nothing on the new SWF. The only information we have is what is stated in Chikwanda's budget statement. The Government has now published the draft Constitution of Zambia after persistent demands by civil society and other members of public. There is no roadmap on what happens next. What is clear is that we are not going to have a new constitution before 2016 because the time has run out. The Patriotic Front (PF) may choose to pursue a selective amendment approach if they can reach consensus with the opposition. However, the most optimistic outcome would be a referendum at the same time as the general election. That too is highly unlikely because the current draft is still quite a flawed documents in many parts. And of course PF disagrees with many parts within it. I have been forgetting to share this document, though I suspect many of you may already have downloaded it from other sources. This is the plan that defines what the Patriotic Front are allegedly aiming for in Zambia as they seek re-election in 2016. (b) 20 percent Mineral Royalty for open cast mining operations as a final tax. Effectively what the measures do is increase underground mining royalties to 8 percent from 6 percent. It has also introduced a 30 percent corporate processing and smelting tax. Another 30 percent tax would be applied to income earned from “tolling”, industry-speak for an agreement to process another producers raw materials. A visual representation of the Budget yesterday as delivered. I thought it was worth showing how the word "continue" stands out. The main surprise is how often the word governance is used! 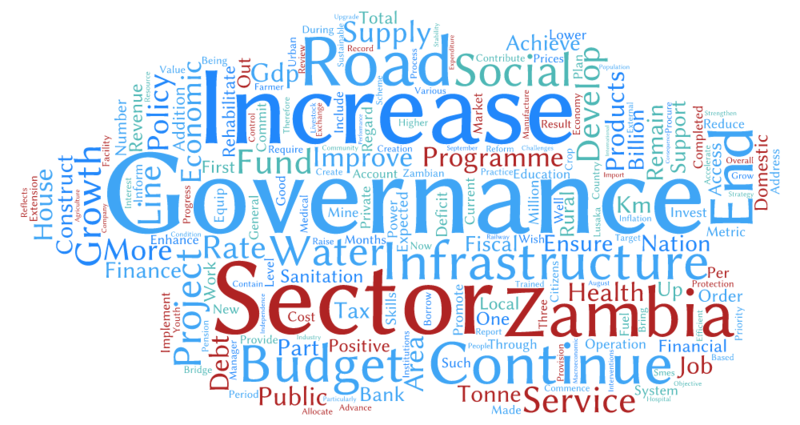 Finance Minister Alexander Chikwanda delivered the Budget Statement 2015 earlier today. I have read through it but not fully process it. Everything in the Budget was leaked to the Post newspaper. There are no surprises in that sense. In short it a budget short of new things - the word "continue" seems to be all over it. However it does contain important proposals relation to the mining fiscal regime and ZCCM-IH. More discussion on the proposals in due course. On October 3rd, 2014 the Zambian Kwacha, Nigerian Naira and Kenyan Shilling debuted the Johannesburg Stock Exchange (JSE). This is the largest and most liquid stick exchange in Africa. The move has been heralded as a milestone by Government but with little explanation in the media about what it really means for ordinary Zambians. This article is designed to address some common questions that have been posed by the public. What is actually being traded on JSE? The forex market on the JSE is not a currency bureau, where people can buy and sell the kwacha. This is a futures market, where investors and businesses that import or export can buy Currency Options or Currency futures, which belong to the derivatives market. Glencore (owners of Mopani Copper Mines) last week halted operations at its Sable Zinc Kabwe mine because of withheld valued-added tax refunds owed to the company. Mopani has also suspended part of an $800 million plan to boost production of copper by 50 percent. The Zambia Revenue Authority has held back on paying mostly mining companies more than $600 million VAT refunds, because it says exporters haven’t complied with a rule requiring import documents from the countries the products end up in. Mopani alone is owed more than $200 million in refunds. A Comment on Elias Chipmo's article on VAT refund. It is refreshing to read Elias Chipimo's insightful contribution on the VAT refund - see the article VAT refunds to mining exporters . Our only observation is that what he has written is factually correct. And we would like to offer some additional points that perhaps he could have made more clearer. First, the way VAT is applied is an issue of "international best practice" rather than international legality. Every country is entitled to apply VAT refunds in a way that is consistent with its domestic policy and laws. Whether you follow best practice is a question of knowledge and competition rather cast iron laws. Secondly, the article could have more explicitly noted that ZRA is merely trying to enforce the law and regulations as it understands them today. The fact that previous Finance Ministers have coerced ZRA to act in a certain way is irrelevant to the discussion. We need to distinguish policy and best practice from the legal position of the actors involved. We felt that this distinction was not adequately addressed in the article. Let me start with a surprising statement: every finance minister since 1997 has been refunding mining companies for the VAT that they pay when they bring goods and equipment into this country. This includes Edith Nawakwi (under President Chiluba), Peter Magande (under President Mwanawasa) and Situmbeko Musokotwane (under President Banda). It was therefore surprising to see the current finance minister, Mr. Alexander Chikwanda, being criticised in the media recently by some of his predecessors for advocating VAT refunds to mining companies - something they themselves did regularly over the past 17 years.